Still staying with our study of our Retailer I promised to look in further detail at the tools and Capacity Management Process deliverables and how well they are using them to meet their needs. The first column in this case shows the various target domains, the second the tools available. 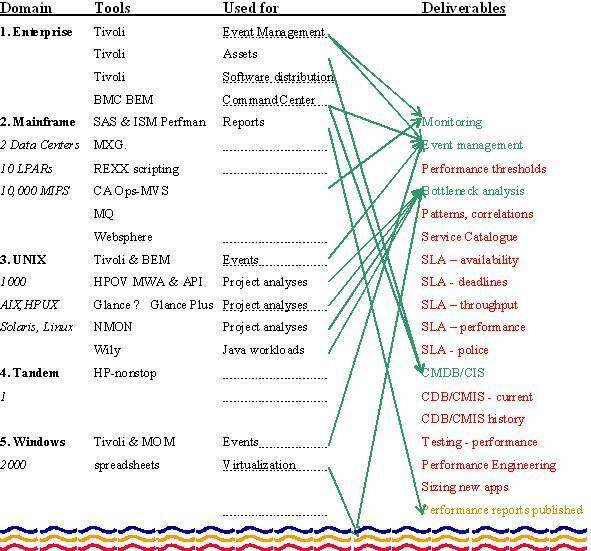 The last column shows the deliverables. The arrows indicate which parts of the tools are exploited to meet the required deliverables. In this site there is a wide mix of tools from different datacenters that have been merged slowly over the years. So as well as supporting a number of different variants, there is also a central objective of “standardising”. This typically adds an extra dimension in terms of support requirements which is an overhead until fully established and the previous standards are retired. 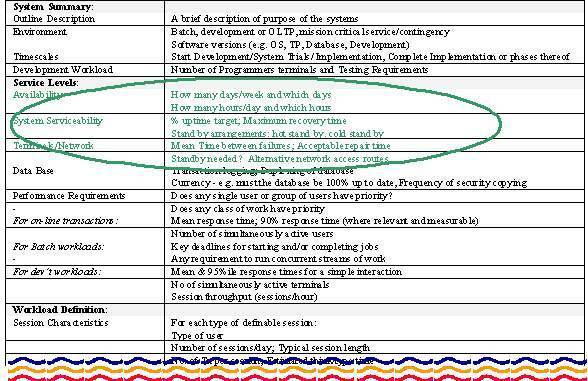 The next reports reflect a more detailed analysis starting with this review of the typical metrics available and those that are collected at this site circled in green. There is a potential issue with this report in that each platform tends to be somewhat different in its level of detail. 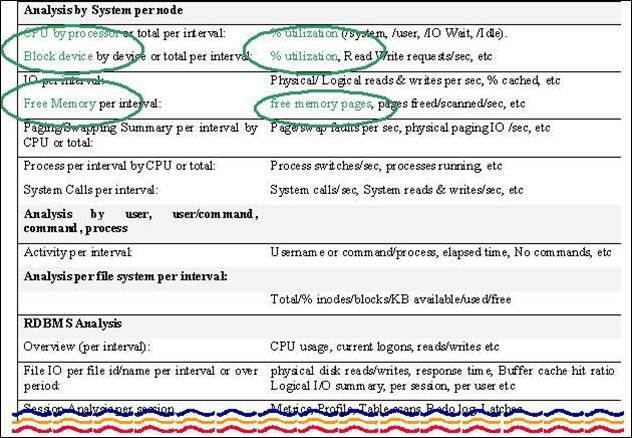 That is, most mainframe servers collect and store a wide array for SMF/RMF record types, whereas most UNIX servers will store a limited selection of statistics and Windows servers likewise. However, there is often a reasonably consistent attitude to storage and exploitation of metrics across the domains at this level of detail. This report reflects the level of data required for effective performance engineering and the need for good data flows with development and testing. Again circles are used to indicate what happens at this mythical site. 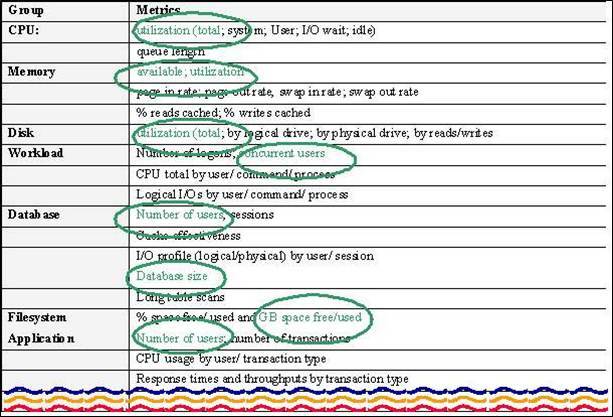 This shows a typical list of reports required, with the related key metrics in the second column. Once again green circles are used to highlight the areas addressed within this site. 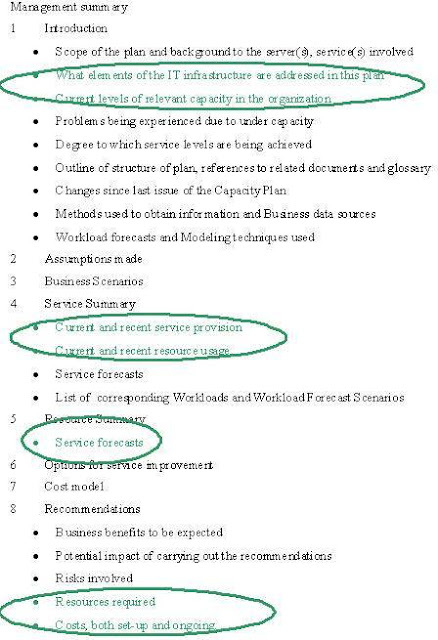 A standard capacity plan template is used to highlight those areas that are incorporated in the sites internal capacity plans. 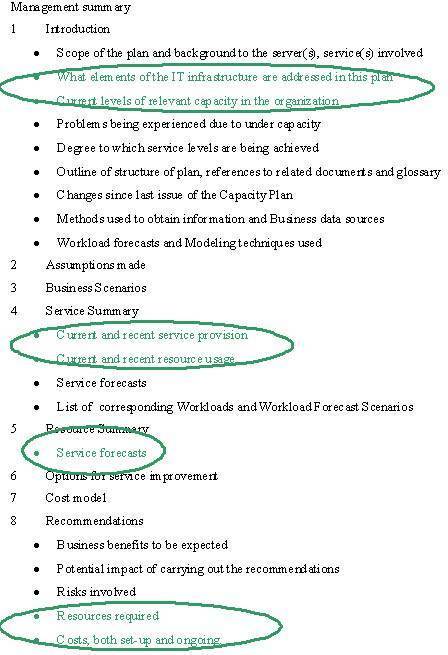 In this case it is clear that there are few formal capacity plans but within the capacity management team a number of key practical areas are assessed. The lack of a formal report leads to a poor perception of the abilities of those involved which could readily be rectified by a more open and transparent reporting system. On Wednesday I’ll be concluding by looking at how this all translates in to a SWOT analysis.